Hello Laides, What better way to start December than with another giveaway. 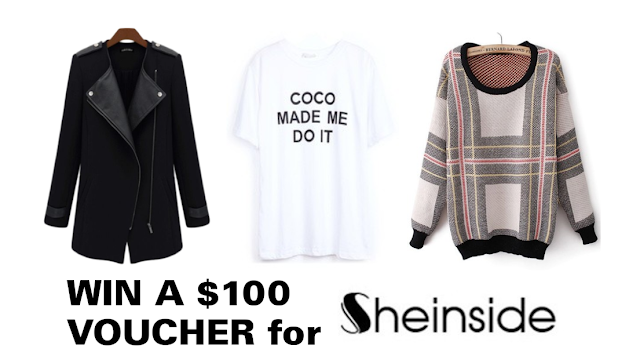 This time I've partnered up with Sheinside to giveaway a $100 voucher to spend on anything you want from their site. This giveaway is open worldwide and will end on December 15. :D I'm planning to do more giveaways this month so stay tuned and GOODLUCK! i'M FOLLOWING YOU ON FACEBOOK, INSTAGRAM AND YOUTUBE! You look beautiful in that outfit. Love that coat! I must have it! Me encanta sheinside! Gracias por el sorteo! Aww thank you for the giveaway!!! I LOVE sheinside!! Hi I follow you everywhere!!!! Jag är med och har gjort allt som står! Följer även dig på bloglovin nu! Love the outfit and the jacket is to die for!